supplies to National Medical Store workers. Since the 4th of April flash flooding in Solomon Islands, Honiara has been hectic. Government ministries, United Nations, non-government organizations, private sector, schools, hospitals, clinics and communities have all switched on their emergency mode and put everything else aside to provide safe water, food, shelter, basic sanitation and hygiene facilities to thousands of flood victims. School staff and students and communities have pitched in to clean up so that children could get back to school, and families are trying to rebuild damaged businesses and homes. Equally in emergency mode is the team at the country’s National Medical Store who have worked endlessly over the weeks to ensure that all emergency medical supplies are in good condition and quality, sufficient quantity and most importantly delivered without delay when required. “It has been a hectic month for us. The demand for medical supplies from the National Referral Hospital’s emergency outpatient unit, clinics and the health mobile teams have forced us to be on near constant alert”, said Timmy Manea, Director of National Pharmacy. This high demand over the past weeks has also reduced medical supplies and some, such as zinc and albendazole, are now out of stock. “We are grateful that UNICEF together with other non-government organizations and agencies for the continuous support in terms of supplies, which has enabled us to maintain our emergency stock and hence continue to provide the necessary health services and treatment required for the affected people,” said Mr Manea. Manea also highlighted that diarrhoea, including watery diarrhoea, are among the main waterborne diseases common in the evacuation centres and affected communities which have had great pressure on their stocks. “This supply assistance will greatly help us in fighting against these diseases”. 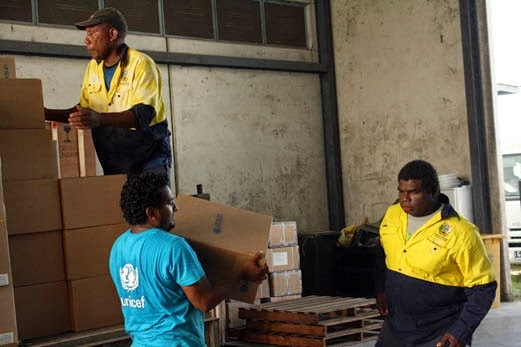 UNICEF this week delivered medical supplies to the national medical facility including: includes zinc, albendazole, oral rehydration salts, micro nutrient powders, retinol and ReSoMal, and therapeutic milks for malnourished children,that are worth up to $170,000 SBD. These supplies will be distributed to hospitals and clinics in Honiara and Guadacanal as well as the mobile health teams on their continuous visits to evacuation centres and communities.